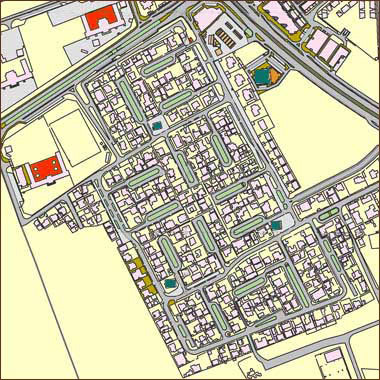 This section will deal with the planning of an area of Doha, south of the ‘C’ ring road known as al-Salata al-jadida. The site houses people from the al-Salata qabila who moved from Feriq al-Salata, adjacent to the port in the east side of the old town of Doha, to this part of Doha. When they originally moved in the 1970s, this part of Doha was outside the ‘C’ ring road, at that time the limit of development to Doha. The importance of this housing is that it was planned in accordance with very different principles from those that were being used for the Popular Housing, at that time the standard way of assembling new housing estates. The principles used in the planning of both types of development are dealt with on the new approach page. Some time ago I was responsible, together with an Arab architect and planner, for the design and layout of a development of Public houses on this new site. The plots were thirty metres square and the houses were required to be central to the plot. This isonometric drawing illustrates the development of a form of courtyard house on a cul-de-sac layout before the central location of existing house types became a requirement. Nevertheless, the planning layout incorporated a number of novel features based on traditional layouts and was developed and approved in the majlis of the qabila for whom the layout was designed. Regrettably we were not able to develop the system elsewhere for public housing because, having seen the site in action – and bearing in mind a number of inaccuracies and eccentricities in its setting out and occupation – it appears to work exactly as it was intended. Developed sketches of the courtyard house can be seen on the page looking at public housing. We were, later, able to use some of the principles when developing the Senior Staff housing project in the New District of Doha. permeability for pedestrians through their site. The above ranking is not theirs, and is not hierarchical. Not all the individuals wanted the same thing and it was significant that there was considerable variety in their wishes. So the layout had to be adaptable to different kinds of individual requirement. It was evident that some plots would be joined together, that there would be a variety of house sizes both in terms of area and storeys, and there needed to be both a sense of space and a sense of identity for the qabila and the inhabitants of this new development. There were a number of issues that were political in nature and some would have been resolved in the physical development. Certain issues we understood through conversation or advice by other interested parties and some by observation in a variety of other housing areas, but it is entirely possible that we did not understand everything that was desired or required. Nevertheless, we felt that the above list highlighted the essential points made, and that most of these could be developed to benefit the members of the al Sulaiti qabila, and to act as an example for future development. I should mention as background here that there were intense pressures on Government ministries, particularly the Ministry of Public Works, to provide houses quickly. Qataris were keen to have their houses taken by demolition and there was significant and intense lobbying both of the Government as well as expatriate professionals with a view to establishing a tabula rasaon which the town could be re-planned. In some areas, such as al Khor, where attempts were made to keep the shore-side housing in order to refurbish it as an example of the past, it proved impossible to stop the bulldozers. Sadly the area was then left in a state of disrepair for years with the new housing constructed inland of it, and without the concomitant planning needed to support the housing. In the event, the Salata al-jadida project took off too quickly due to pressure from the family together with the fact that some of them worked in the Ministry developing the site. This in itself wasn’t too difficult to deal with but, regrettably, a number of errors were made in establishing levels and designing a sensible drainage plan, setting out the housing and its layout properly, and assuring the correct sizing of the pedestrian sikkak. It is also a fact that not all the house plots were equal in size. This photograph illustrates what was designed to be an 1800mm wide sikka leading from one cul-de-sac to another. As constructed it is wide enough to take a car through it or, as I have seen from time to time, used as parking or even for temporary garaging. However, one thing has saved these sikkak, that is they work in the manner for which they were intended: pedestrians can and do use them to move around the feriq. The principle of using culs-de-sac was one which developed out of the conversations with, and presentations to, the qabila and was seen to be a way of obtaining a sense of security, an issue which worried them in the new State developments at Medinat Khalifa. That development was characterised by an open road network with dangerous junctions, and a lack of identity, every plot fronting onto a through road. This diagram illustrates 9, 7, 5 and 3 properties notionally grouped around an open, common space. The manner in which this came about and its development is discussed in more detail on the approach page. You can see that the 9, 7 and 5 property culs-de-sac have a form of constriction at their entrance in order to obtain a sense of enclosure and, through this, privacy. Of course there are other ways in which this could be effected. The simplest would be through the use of landscaping, both hard and soft. This would have the advantage of introducing colour, soft forms and movement into the area. This will be looked at elsewhere, probably on the approach page. This first illustration of feriq al-Salata al-jadida is an aerial photograph showing its relationship with a portion of the ‘C’ ring road which is visible as an arc across the north-east corner of the photo. A primary distributor links the ‘C’ ring road to the ‘D’ ring road out of picture to the south-west, the distributor being visible cutting across the north-west corner of the photo between them. Both these major distributors, primary roads, were designed as dual-three roads – roads designed to take three lanes of traffic in both directions. You can see that, as you might expect, the circular ring road – the ‘C’ ring road – is much more heavily used than the radial link road as can be seen by its colour. You can also see that that Salata al-Jadida layout is designed to inhibit through traffic. This second illustration shows the built plan for Salata al-Jadida to the same scale. Incidentally, I have not drawn scales on these drawings, but bear in mind that the house plots in al-Salata are thirty metres square. Although you can see the theoretical layout quite well illustrated, it is not possible to see at this scale the many eccentricities that were, unfortunately, made in the execution of the development layout. You should also be aware that in the southern part of the site it was not possible to lay it out while maintaining all the design principles. Using culs-de-sac in a geometrical manner means that you have to be able to plan on sites large enough to contain the geometry. When the site isn’t large enough for this, or when the shape of the site is irregular, then there have to be compromises where as many of the principles of the design are maintained as is practicable. there is taswiq integrated into the layout, but how this was planned will be dealt with elsewhere. There is no real local centre within the feriq, just a number of dukaakeen located on a relatively random basis. The basic principles of the cul-de-sac layout can be seen in the planning of the centre and north parts of the site. I shall deal with the reasons for there being eccentricities in the layout later on this page and how this has or may have affected the operation of the layout. Here, for a direct comparison with the al-Salata al-jadida layout, are two oblique aerial photographs. 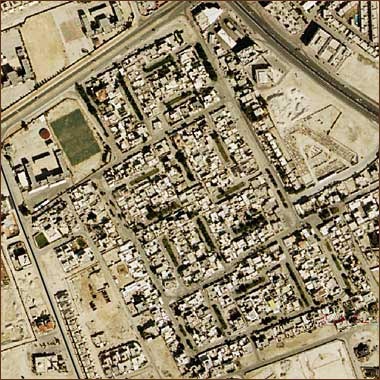 The first is of an area of north-west Doha known as Medinat Khalifa, illustrating the standard government response to housing layouts of the early nineteen seventies. The houses, known as ‘Public Housing’, were three-bedroomed, single storey structures set within thirty metre square plots, and were designed and constructed for nationals whose housing was taken for redevelopment in town, or who were being settled from the desert. The key distinction between this character of layout and that of the the al-Salata al-jadida layout is a social one. The al Sulaiti family were re-housed as an entity, the whole qabila being rehoused from their feriq on the east side of Doha to a new feriq on what was then the south-west side of the city. Medinat Khalifa is essentially composed of individuals or relatively small groups of related families. This second oblique photograph is of one of the new towns in the centre of the country. The houses are identical to those above. It can be seen that there has been growth of a number of trees in gardens but that the streets are not yet paved. I believe this photograph was taken in the mid nineteen-nineties and illustrates a very typical stage in the development of these small new towns. In both these layouts the road system was envisaged as a circulating local distributor, with no provision being made for landscaping, the ground floor treatment of the area between house walls being seen as paving on both sides of the roads, though neither roads nor paving were established for some time as you can see from both photographs. You can also just see that there is a problem with privacy from house to house due to the practice of constructing the ground floors at least three steps up from the finished garden level. This lifts the windows higher than the surrounding boundary walls permitting direct sight from one interior to the neighbouring one, an issue that causes difficulties between neighbours. While arguments are commonly the result of this, the effect of the lack of privacy is that families find it difficult to use their houses as they would wish, sometimes taking to living in the internal corridors to avoid being seen from outside. I shall write more about the materials and systems of construction elsewhere. But it is worth noting here that the construction of this housing was carried out, in the main, in contracts of no more than six units, each contract under a different contractor, often their first project. The houses were constructed of hollow concrete blocks with a reinforced concrete frame and floors, on thirty metre square lots with the house centrally located within the plot. Boundary walls were also constructed of hollow concrete blocks supported by in-situ reinforced concrete columns. Access to the plot was via a steel pedestrian gate or large double steel gates giving access for vehicles. Perhaps it is not difficult to understand that many of the houses were not built as well as they might have been, creating not only a maintenance problem but significant dissatisfaction. The set of photographs below illustrate three stages in the development of housing layouts in Qatar. They have been arranged to line up for easier comparison. Though I realise it is not that easy to see detail in these small photographs, I think there is just about enough for simple comparison. The set of three photographs below illustrate stages in the development of housing layouts in Qatar. They have been arranged orthogonally for easier comparison. Though I realise it is not that easy to see detail in these small photographs, I think there is just about enough for simple comparison. The problem of social facilities not being constructed contemporaneously with housing is a common problem all over the world. Although it is recognised as absolutely necessary in order to assist new societies to develop and integrate relatively quickly, the pressure on funding often means that it is only the housing and associated services that are first developed. In Qatar that has been taken as an opportunity for small retail facilities to be opened by residents on a relatively unplanned basis, usually involving turning garages into a shop. But there is another factor in Islamic countries where the society has a different, more integrated character than in the West, and where the links between members of a neighbourhood are stronger. The difficult really exists more strongly in the opportunities or, more accurately, the lack of opportunities that the housing layout gives for the residents to live their lives according to their customs and to provide for growth and development. I believe that this form of housing lacks significant opportunities for residents, particularly in terms of privacy as well as having a traffic arrangement that is potentially dangerous. There is also no pedestrian system other than that alongside the roads, with no natural meeting areas. This first photo is of a part of Medinat Khalifa in the north-west of Doha and shows the planning arrangement favoured by Government for bayt sha’bi, the Public Houses given to Qataris who do not have the money to build for themselves. The layouts were characterised by having the houses – constructed within thirty metre square plots – erected on an undifferentiated gridded road system which has dangerous intersections. There are mosques, usually within the system, and schools on the periphery, but no structured positioning of retail facilities. This second photo is of the Salata Jadida layout near the ‘C’ ring road south-west of the city centre. I have described the principles behind the layout previously but you can see that there are no cross-roads; every junction is a t-junction with an obvious hierarchy. sikkak have been provided for access and privacy. There are locations for mosques as well as retail facilities, though I have to admit that the tendency for anybody to open a shop in their garage has not been dissuaded. This third photo is of a part of the Senior Staff housing area in the New District of Doha. You can see the same principles of a hierarchical road system with no dangerous cross-roads, culs-de-sac for privacy, and the housing linked by sikkak. What is particularly noticeable is the density of the housing. Senior Staff housing is constructed on plots that are thirty-five metres square. This is two storey housing; compare it with the single storey public housing above. There has been considerable house building in Qatar in recent years, though the majority of it has been for expatriates and, in many cases, has not been suitable for Qataris. I have to admit that I am not sure whereabouts in Qatar this fourth photograph was taken but I have assumed it is designed for Qataris from its character. The reason I’m including it is that there is an obvious attempt to design the layouts using culs-de-sac. It is not a complete cul-de-sac layout, and the hierarchy of roads is not well defined, but it is evident that somebody thinks the cul-de-sac a useful basis for at least a part of the layout. The villas appear to be relatively large, and it looks as if it is planned to have seven houses round the cul-de-sac. The above four photographs should give you a little understanding of the progress of housing layouts in Qatar and, of course, there have been more developments over the last twenty years. But the Salata al-jadida housing has had some time to settle in so it is instructive to see what might be learned from a superficial visit around it. As I have written above, the basic geometrical layout of the area was produced using a cul-de-sac comprising seven houses; and, due to the constraints of the site, it was not possible to use this seven-house unit all over the site. Nevertheless, where it was possible this was the optimal solution that was provided to as many people as possible, the basic design parameter being to ensure that every owner had a degree of privacy provided to the housing unit. In this photograph you can see the basic seven units of a standard cul-de-sac in the process of construction and the sikkak system feeding left and right out of the far end of the cul-de-sac. But, more than this, it was felt important to give a sense of security to each cul-de-sac and, in this photograph you can see how constriction of the entrance road achieves this. In this particular case two storey development and the growth of what look like acacia trees have helped in producing this feeling from the outside of the cul-de-sac, psychologically inhibiting entrance by those with no business there and, conversely, creating additional ‘ownership’ for those living in it. One of the difficulties inherent in the setting-out geometry of the cul-de-sac is the corner created by restricting its entrance. In this photograph an owner has taken advantage of its location to make a majlis opening onto the cul-de-sac. It looks as if he has also ramped the kerb in order to ease access of his car to the door of the majlis. If the external space associated with the majlis was converted into an external majlis it would certainly improve this part of the cul-de-sac. Another possible use for these corners in culs-de-sac where no majlis has been created would be to use it for the refuse bins for the cul-de-sac. I should also point out here what you will be able to see in most of these photographs – that not a great deal of care was taken in the setting out and construction of the Salata al-jadida area. You may have to take my word for it in reference to the setting out, but you will certainly be able to see it in the finishes, particularly of the roads and associated kerbing, trims as well as the installation of utilities after the roads have been laid. Here is the view you get once you clear the entrance to two other similar culs-de-sac. In the top photo the wild acacia trees have been supplemented with date palms and with bougainvillaea falling over a boundary wall, displaying its colour in the cul-de-sac. Ramps have been added where owners have raised their sites to protect them from flood water. In the lower photo there are acacia trees again and what looks like a wild palm, or at least one that has not been trimmed as it grows. In the middle of the cul-de-sac, on the right in the lower photo, there is also a water fountain installed by the adjacent owner to benefit any member of the public passing. The lower photo shows that the cul-de-sac is being used by young children playing in relative safety. They came to the entrance of the cul-de-sac to talk to me as I walked by, and they obviously felt safe in the immediate vicinity of their homes. It is a good indication of how easy it is to spot strangers in and around their houses. As you move around, there are always one or two people about who will notice you; children, servants and the men of the families moving in and out of the cul-de-sac, or around their house and its entrance. This photo illustrates the difference no planting makes to a part of the layout. I’m not sure if this is a cul-de-sac but think it must be a part of the local distributor system due to the two and three storey housing associated with it. What is interesting is that the central area has been grassed and the grass cut, there is somebody with a football on it and three or four other children walking about. I assume that there has been a decision to keep the central area available for recreation, a decision that will have been locally made. What is disappointing in most instances is the amount of tarmac used. The colour and material attracts and stores the heat in summer making the area less comfortable than it might be. These three photographs were not taken in feriq al-Salata, but I’m using them here to illustrate a couple of points relating to the character of this type of development. The first photograph shows one of the ways in which culs-de-sac are developing as owners take control of the area outside their properties. There are two things to notice here. Firstly, the effect which planting against the outside property wall has in softening the area. In the longer term the trees grow creating shade and their own micro-climates, and this brings insects, birds and a degree of colour and motion which improves the area. But, more important to my mind is the way in which the owner in the far corner has left his car outside his gate and has planted a trimmed hedge. Accepting ownership of a part of the external area of a property, whatever the legal ramifications, is one way in which owners demonstrate their attitude to their house and area. It should be encouraged. Here my point is to demonstrate how enclosure and planting affect the appearance of a cul-de-sac. In this photograph there is at least one building missing on the left of the view. Because of this there is a long sight-line which appears as a continuation of the central, un-planted area of the cul-de-sac. With time and the development of the missing buildings, this will be closed down and the appearance will be more similar to a continuation of the planting to be seen on the right hand side of the photograph, creating an enclosed, central space of a very different character. When the central space is landscaped, either by the government or the surrounding owners, there will be a substantial benefit to them in terms of ownership, amenity, environment, security and privacy. In contrast to the photo above which shows a cul-de-sac open at its entrance end, this photograph was taken from the roof of a building overlooking the closed end of a cul-de-sac, the building which will complete the end of it not yet having been constructed. I have added it here as it demonstrates something of the quality that can be obtained with planting. The buildings surrounding the cul-de-sac are of the usual, nondescript type which characterise much of the urban residential development in the country, yet they benefit from the provision of this external space. This provides the semi-public space which is so beneficial to Qatari life, though I am not sure if this housing is for Qataris or expatriates – or both. For whichever condition, the residents will benefit from this external space. One of the difficulties of using culs-de-sac as a basic element of an urban layout, is that the houses that are not within a cul-de-sac might be thought to suffer in not having the benefits associated with the cul-de-sac. In the Salata layout there were two particular factors which informed the design of the local distributor road. Firstly, there were a number of the family who expressed a desire to be located in a prominent position. By this they meant that they felt there would be benefit to them if their house would be seen by those passing and not hidden away in a cul-de-sac. It might be thought that this was a reflection of their placing, or perception of their placing, in their society but, contradicting this, those at the top of the family specifically asked to be located in culs-de-sac with their immediate family around them, the head of the family at the far end of the cul-de-sac. So I assume this was a case of individual taste or a more complex rationale that was not enunciated to us. It followed from this that those houses located on a local distributor road should be set in such a way as to benefit them from an urban design point of view as well as safeguarding movements in and around the property for both vehicles as well as pedestrians. This reasoning also formed the basis of the general approach to the layout of this part of the district. Many of these houses were two storey and easy to position though it has to be stated that we had little or no control over who went where and how large their houses were. This was all decided by the family privately or in majlis allocating the sites for the different members of the family. Here you see a house in what we in the West would feel to be a prominent position. Bear in mind that the plot size for the Salata al-jadida houses was thirty metres square. The solution we designed used two principles for establishing the working arrangement and, therefore, character of the local distributor. The danger of long straight roads was recognised by cranking the local distributors in order to slow down fast traffic and, where housing had to front onto those roads, a separate road separated from the distributor by a landscaped strip was provided. That was the theory. In the event this was not always found practicable, particularly when the original site boundaries were amended and the layout adapted to fit the changed site. None of these examples shown here are ideal but, together, they should give an indication of intent as well as illustrate how, despite the many eccentricities of layout, the site is successful, particularly when compared with public housing generally. The first photograph shows a wider than usual landscaped planting strip that has been planted privately and maintained, an illustration of how the area has come to be ‘owned’ by those living there. Indicators such as these are useful in understanding how the planning of an area serves those living there. It is particularly notable as there is a widespread assumption that the Municipality should be responsible for all planting. This next photograph is, in essence, based on the same principles as the one above it. The slip or parking road is separated from the local distributor by a narrow planting strip, and the local distributor can be seen to be following a chicane in the distance. There is a clear separation between the elements of road used to distribute traffic and those associated with the housing and shops to the side of it. In these two photographs the distinction between local distributor and parking area is still defined but the width of the parking area is greater than was intended. Owners of the frontage properties have taken advantage of their positions – and perhaps this was another reason some owners sought front lots rather than culs-de-sac – to open up their front walls to commercial enterprises. Usually this process began with the garage being turned into a shop, often with the shopkeeper being also employed as watchman and gatekeeper. As I have written about elsewhere, this practice tends to be a reflection of the manner in which Qataris were keen entrepreneurs and permitted to establish themselves as agents for foreign products, their houses being the least expensive alternative base from which to sell these products. I should also mention that, in the seventies, Planning Permission was required for opening a commercial unit or for a change of use but, in those early days permission was often overlooked by both house owners and, following conversion of use, the Municipality inspectorate. In some cases shops were opened in areas that were inappropriate. Shops, grouped adjacent to a local distributor, make excellent sense in the distribution of retail facilities in a hierarchical manner. Isolating them as in this case makes less commercial sense as well as encouraging strangers to move further into private residential areas. You may have noticed in a number of photographs both on this page and others, the presence of the wheeled galvanised steel Municipality refuse bins. On the streets they seemed to be extremely noticeable, standing out against the property walls for anybody living in or visiting the housing. They tend to smell, are often surrounded by rubbish and nearly always seem to have cats in attendance. None of the housing areas in the country can be said to have proper provision made for these bins; Salata is not alone in facing this problem. I have suggested a theoretical solution to the way this might be dealt with, but there will need to be consideration not just of the type and location of bins but, more importantly, how to deal with the issue of sorting and recycling the material thrown out by growing households. Essentially, these bins need to be cleaned more effectively and more often and, perhaps, be redesigned though it is realised that they are part of a system designed to be emptied by a mobile refuse truck. There are three local mosques in the Salata al-jadida area. They are identified in the plan shown above. The first, shown under construction in 1973, is directly associated with a cul-de-sac, that below it is in a more exposed situtation. They are both located on the local distributors in order that people worshipping at them can move through the sikkak system from the more private areas of the housing, or can travel around the area to the mosque of their choice. Although there is always some car parking associated with mosques, the habit is to walk to and from mosques for the five daily prayers. Because of this it is important to have a well defined, shaded route for the majority of people to use. In the case of Salata al-jadida many of the routes are accomplished by walking through the cul-de-sac system, using the sikkak where appropriate. Another indicator of the ease in which people have adapted to the area is the manner in which they have established majalis, and their location. These four photographs illustrate the informal manner of their arrangement. The first photograph shows the most traditional interpretation with a baraha formed on two sides of by wooden dikka with the third side being a built-in arrangement attached to the majlis wall. It is important to note that all three of these arrangements – the one above and two below – are located in the semi-public area of the site. This photo shows the setting of the majlis above, illustrating how it overlooks a part of local distributor system making it easy for passers-by to see who is in the majlis, and for those in the majlis to watch passing traffic and invite friends to join them. Each of these majalis is located immediately adjacent to a house, most likely also adjacent to its internal majlis. In this sense it is the same majlis, its location moved in response to clement weather. Remember that the word majlis refers to both the physical location, and the activity practised there. Its great benefit here is that it is outdoors and those sitting in it will be able to enjoy dusk and nightfall as they sit with friends. It is an enjoyable time of day, and a pleasureable experience, with a more natural feel to it than when experienced indoors. From these external majalis the life of the area can be seen, friends and family invited to sit and talk, and any strangers observed. Ideally these majalis are situated adjacent to or overlooking the local distributor road system. Note that the lower majlis is adjacent to a drinking fountain, a feature which is commonly added to the outside wall of a house in order to benefit passers-by. Returning to the culs-de-sac for a minute it is very noticeable that, within them there is a genuine feeling of safety and privacy. Children play freely, servants and men move in and around the system, and there is a general air of calm and relaxation. Here the gates to one of the plots have been left open, the garage area is plainly seen along with a part of the internal landscaping, and one of the owner’s hens is freely wandering around. Associated with the culs-de-sac are the sikkak, the pedestrian routes that link culs-de-sac together as well as to the local distributor system where there is access to circulating traffic such as taxis or, in certain cases, buses. These two illustrations, the second of which is also shown at the top of the page, are examples of the inaccuracy that characterises the setting out of this housig layout. The sikkak shown here, both under construction and finished, illustrate the problem most clearly. The setting out of a sikka was designed to be 1800mm wide in order to give shade to the pedestrians using it. A narrower dimension would have been more acceptable in that it would have produced more shade. Bearing in mind this might have meant that the adjoining housing plots would have been larger, it is surprising this appears not to have happened. The first photograph illustrates how the plots were staggered in order to avoid seeing long distances through the layout. This sikka joins a cul-de-sac which can be glimpsed to the right with another sikka joining from the left. The second photograph shows that the sikka has not been closed off by the returning wall of another sikka but has been left open to the linked cul-de-sac. In urban design terms, specifically Western urban design terms, the view is relatively attractive, closed as it is by a tree – almost a classical vista. In traditional Arabic urban design terms the view is open and insecure, permitting people to be seen readily. In order to make the site appear more private and secure it was the deliberate intention to avoid long sight lines such as that shown above. Within culs-de-sac of seven house plots there is obviously a difficulty in keeping sight lines short but, in the sikkak this can be readily effected with, in theory, no sikka being longer than two house plots – sixty metres. This sikkak shows how they were generally intended to look, but bear in mind that planting has yet to be effected, both softening the lines, adding colour and movement and augmenting shade for those using the sikkak. Compare the view of the open sikka with this and the photo above it. Here there is a returning wall which, albeit in the wrong place, helps to close off the longer view along the sikka and, in this, is aided by the planting of a ficustree. It is notable that the owner of the house on the right has opened up a door to the sikka directly from the house. It was always intended that this should be permitted but it was considered that access to a sikka would be more likely through a garden wall than from the house itself. In the event it makes no difference other than that I believe it significant in that it shows the owner felt it a safe decision to make. Finally, this photograph illustrates what was originally intended for the sikkak from a layout and urban design point of view. The width of the sikka appears to be approximately correct, the end of the sikka is visually stopped by a splayed wall which leads pedestrians round the corner. The view is accented visually by a fortuitously placed palm tree in the far owner’s garden. The splay has the advantage of leading pedestrians but the eye psychologically around the corner and, in this case, the glimpse of the cul-de-sac reinforces the sense of safety and identity with the site. The only unfortunate aspects of this particular sikka are the standard of finishing of the floor and the air-conditioning units together with their protective cages. These are both common problems not just across this site, but on other sites. Maintenance of pavements is problematic due to both specification and application, as well the manner in which companies are selected to carry out this work. However, the pavements are generally maintained and provide a relatively safe surface for those using them. Before the pavements were finished with the customary tarmac, it was obvious from the beaten tracks on the ground that they were well used. the latter of which is evident in the above photograph and, bearing in mind finaa’, always surprises me when I see it. Condensate is more of a visual nuisance but can create problems with the pavement surface both by assisting its disintegration as well as making the floor slippery. But the more serious problem is created both by air-conditioners and their enclosing security cages jutting out into the public domain where people using the sikkak are at risk from hitting their heads. It appears that the State either has no rules governing the placing of air-conditioners or an ineffective policing or inspectorate system. In either case it really should be the responsibility of owners to protect those passing adjacent to their properties. I have written elsewhere about the tendency there is to add utilities to buildings, completely destroying any benefit there may be in the original building design. The main culprits are water tanks and air-conditioning equipment but television aerials have always been a problem in Qatar. While this photograph may not illustrate the best architectural design in the country, the stepped parapet design is traditional to Qatar and has particular resonance in architectural design. It also has relevance in that it helps to break up the hard visual junction between horizontal parapet lines and the sky above, forming a very attractive feature. But, in this case, it is severely compromised by the thoughtless addition of television aerials. While it is unlikely this is the fault of a designer, there is no reason why a designer should not have provided sensible locations for aerials and, particularly, water tanks as they are elements that are definitely going to be added by the client. Architects traditionally omit these features on their presentation drawings. My experience is that for reasons known only to themselves, architects seem not to see the finished building as incorporating these necessary and obvious additions. What is curious to me is that nobody seems to notice when they appear on the completed building – either that, or architects somehow feel that they have done their bit when the main design is completed and it’s not their fault if things are later added to their design. However, it’s the exception that proves the rule. Sometimes attempts are made to integrate services within the architectural design, but this is mainly on large projects. Even on these it is rare and not always successful. Here a relatively neat solution to external pipework has been accomplished, though it might have been a better solution to have all pipework running inside the building. Obviously there are cost implications as well as detailing and maintenance difficulties to design for. In this case I think the pipework can be argued to be an interesting design feature of the façade, actually enhancing it.